B161 Nickel 201 Seamless Tubes, DIN 2.4068 Pipes and Tubes Exporter, Nickel 201 Welded Pipes and Tubes Suppliers, Nickel 201 Tubing, ASTM B161 Nickel 201 Seamless Pipes, Nickel Alloy 201 Pipes, UNS N02201 Pipes and Tubes Dealer, UNS N02201 ERW Pipes & Tubes in Mumbai, India. A reliable industry in order to fulfill all the desires of every clientele is working harder and are manufacturing and distributing wide ranges of pipes and tubes. As one hold good years of working experience in the industrial zone and dealing as a producer, supplier, and stockholder, they had become specialized in offering Nickel Alloy 201 Pipes & Tubes. To the global buyers, it is offered at customized and standard specifications that vary in wall thickness, sizes, length, ends, types, and forms. It is made available at market leading rates with sales after/before services. On demand for the special application, this outstanding product is offered at custom-built specifications exactly as per the drawings buyers have provided. Nickel Alloy® 201 Seamless Tubes Manufacturer, ASTM B725 Nickel 201 ERW Pipes & Tubes, Nickel 201 Welded Tubes, Alloy 201 Round Pipes, Alloy 201 Pipes & Tubes, Nickel® Alloy 201 Round Pipes & Tubes, WNR. 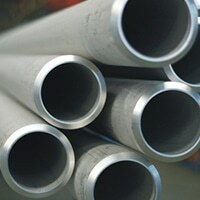 2.4068 Pipe and Tube Distributors in India. Nickel Alloy 201 Pipes & Tubes is the mixture of alloying elements like molybdenum, copper, chromium etc that allows it to have greater resistance to oxidation and corrosion. This makes it easier to use at a variety of industrial applications. The nickel alloyed pipes and tubes are manufactured by using the effective and big machinery under the supervision of well-trained experts. The alloy that is used for product fabrication is 100% pure that adds superiority in the product quality. Nickel Alloy 201 Pipes & Tubes literally are a high-quality product that is widely used in many industrial applications and also it meets product quality standards. The same before packaging and dispatching is well tested and certified and after it becomes certified it is delivered to the buyers. Tests like the ultrasonic test, chemical/mechanical test, and positive material identification test, third-party inspection is conducted for quality assurance.